Many mid-latitude impact craters on Mars are filled to variable degrees with a combination of ice, dust, and rocky debris. Ring-shaped surface features visible in satellite images in these craters led to the nomenclature Concentric Crater Fill, or CCF. Concentric Crater Fill is one of many glacial features found on Mars and originates from ice flow and debris transportation during glacial and periglacial processes. CCF observed today is interpreted to be the remains of repeated periods of ice accumulation and sublimation during the last tens to hundreds of million years. A wide range of observations and measurements suggests that the Martian mid-latitudes experienced substantial ice accumulation during the late Amazonian era (past few 100 million years to present), and remnants of this ice are still present in some crater interiors today. These deposits are expected to be a preferred site for the exploration of ice core records of chemical composition and climate history from the Late Amazonian period on Mars, as well as a non-polar water resource for future missions. Mars’ spin-axis obliquity varies cyclically over time scales of hundreds of thousands of years, probably reaching values greater than 60 degrees and lower than 10 degrees, thus shifting ice accumulation from polar regions to the mid-latitudes and back. CCF seems to develop over many such obliquity cycles. Ice accumulates in the mid-latitudes during phases of high obliquity and sublimates during episodes of low obliquity. Recent ice flow modeling work shows that a cyclical pattern of multiple reoccurring ice layers is needed to fill an impact crater with ice, whereas flow from a single episode of ice accumulation cannot fill the crater in adequate time. Further, CCF originates from ice accumulation in crater interiors, not inflow from regional ice sheets. Here, we use a finite element ice flow model to better understand the process of concentric crater fill and subsequent ice flow on Mars. The model is fully time-dependent and tracks the changes in ice surface elevation as it responds to climatic forcings. Coupled with the ice flow model is a model of surface debris transport. In this, debris is deposited on the ice surface near the crater walls or near topographic peaks within the crater when the ice surface at a node neighboring the wall or peak is below the wall surface. The deposition of debris onto the flowing ice forms a cover that can – once it is dense enough – retard or halt ice-loss in periods of sublimation and during seasonal warming, preserving the ice below. In addition to climate data, the model is provided with idealized impact crater geometries as well as topography from real craters on Mars. Ideal crater bed profiles are calculated based on measured crater morphometric properties, and realistic bed profiles of pristine unfilled craters are taken from MOLA (Mars Orbiter Laser Altimeter) topographic data. In addition to the crater filling process, we investigated the relation between crater position, diameter and infill level in a study of 22 craters in the Utopia Planitia region. Utopia Planitia is a large plain in the northern hemisphere that contains many surface features related to ice deposits. The time it takes to fill a crater with ice and debris depends on the surface mass balance and the crater size. In our study, craters ranging from 5 to 80 km in diameter could be filled within 1.6–7.6 My. Filling times are not to be confused with the age of the deposited material. Observed flow on inner crater walls could be as young as 4.3–4.5 Ma, assuming very protective climate conditions, but it is likely older. At this point, it is not possible to determine the exact maximum age of the CCF. We find that ages as young as 20 Ma or 40 Ma are possible given moderate climate conditions. However, this does not restrict the possibility of additional older deposits ranging back several hundred million years. The ice flow model reproduced observed non-symmetric fill and lobate flow features successfully. Lobate flow features can be interpreted as crater fill that is very young and never made it beyond the lobate flow stage. Asymmetric ice flow in craters can be explained with a non-uniform surface mass balance profile across the crater, for example, higher sublimation rates on the equator-facing side. The filling process, in general, does not depend particularly on crater size. The regional study of craters in Utopia Planitia shows that larger craters with a diameter > 15 km tend to be filled less, whereas smaller craters represent all infill levels. This might be due to differences in the protecting surface debris layer, variations in the net accumulation rate with elevation, or other climatic variations that are currently unaccounted for. In summary, the modeling work shows that early stages of CCF appear as a lobate flow on the steep crater walls and that a debris layer must form on top of the ice in order to preserve CCF to the present day. Spatially non-uniform sublimation rates across the crater result in asymmetric crater fill. 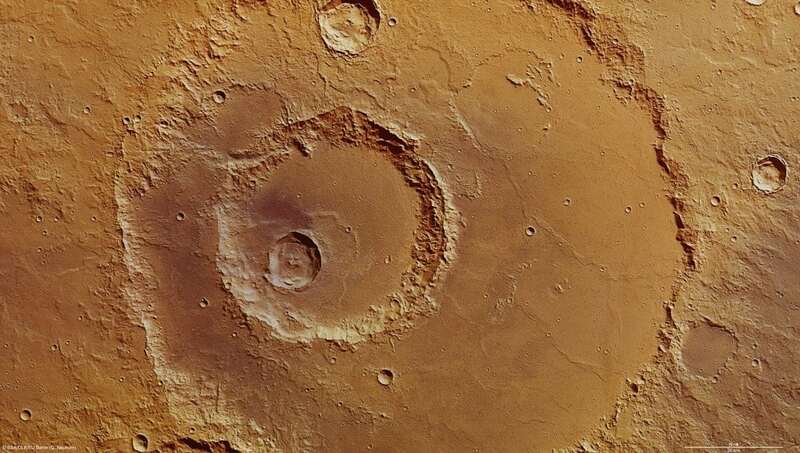 It is possible that CCF is younger than 40 Ma in some craters, which in Martian time scales can be considered as quite recent. These findings are described in the article entitled Modeling concentric crater fill in Utopia Planitia, Mars, with an ice flow line model, recently published in the journal Icarus. This work was conducted by N. Weitz, M. Zanetti, and G.R. Osinski from the University of Western Ontario, and J.L. Fastook from the University of Maine. Nora is a postdoctoral research fellow at the University of Western Ontario.